The Conservative Manifesto leaves us in no doubt what the Tories have in store for those areas of the UK that have been licensed for shale gas exploration. 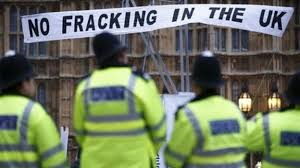 They intend to push for the rapid development of a UK shale gas industry, altering the planning process to enable this by making activities in the process, short of actual hydraulic fracturing, “permitted development”. In the North of England there are now sites being prepared at Preston New Road in Lancashire and Kirby Misperton in North Yorkshire with community protection camps and local activists escalating their resistance. I urge all who oppose fracking to support this resistance. Plans for other drilling proceed across the South of England in Sussex and elsewhere. Another now developing frontline is in the former coalfield areas that span the borders of North East Derbyshire, South Yorkshire and North and West Nottinghamshire where I live. Exploratory drill sites for IGAS and Dart Energy have been granted planning permission at Misson Springs and Tinker Lane, two sites in the Bassetlaw District of North Nottinghamshire. Meanwhile, the chemicals giant INEOS (of Grangemouth Refinery infamy, led by swaggering billionaire Jim Ratcliffe) hold the licences for much of the old coalfield areas of West Notts, North East Derbyshire and South Yorkshire. INEOS have just put in planning permission for two wells – firstly at Marsh Lane, South of the Sheffield suburb of Mosborough and West of Eckington in North East Derbyshire and secondly at Harthill South of Rotherham. At the same time they have announced their intention to seismic test from the area of these sites Southwards on both sides of the Derbyshire/ Nottinghamshire border, starting in early June. They have secured the services of a firm, Arturius International, that makes much on its website of working to develop military sites in places like Iraq and Afghanistan. Their adverts for seismic testing staff (on crappy “self employed” contracts) openly targeted ex services personnel. It is clear from this how INEOS see the local people and likely resisters in these areas. They aim to descend like an occupying force. The attitude and approach of INEOS has done much to boost the continuing growth of local community protection groups in the close knit communities of the former coalfield. Ratcliffe’s minions have spent a fortune on 4, 6 and 8 page adverts in local newspapers; they have schmoozed various councils and councillors and gone round Parish Councils where they have often been given short shrift. The fact that their main cheerleaders locally are Tories and UKIPpers should be no surprise. Despite the wealth and power of the would-be frackers, the resisting communities in the “sacrifice zone” have scored some early successes in delaying and hindering the attack on their water, air, roads, countryside and communities. IGas and friends were delayed by a lengthy planning process which led to a burdensome restoration bond and extended Section 106 negotiations. They now plan to start work in the autumn. We know from Friends of the Earth Freedom of Information requests that INEOS were keen to get cracking before last Christmas and wanted to get access to County Council land for seismic testing. This was torpedoed by Friends of The Earth revealing plans to seismic test and test drill on the edge of woodland that is part of the historic Sherwood Forest. An internationally reported protest followed in front of the iconic Major Oak, looking like a smaller version of the tree in the film Avatar. We now know that this led to political advice that the early part of the year was “inappropriate” for such a decision, which is now scheduled for June, after the elections returned a Tory led coalition at Notts County Council. The support of the Unite Union, in particular Unite Community, has been very helpful in initial funding for getting local groups off the ground. There is good support from the wider labour and trade union movement and all the national environmental organisations. The exceptions of course are the GMB union, whose rotten quisling leadership actually lined up with bosses organisations and the frackers in Lancashire to call for harsher policing against protesters and protectors. Unhelpfully one or two of the former Labour MPs in the old coalfield, like Natascha Engel in the area that includes the Marsh Lane site have also swallowed the INEOS line hook line and sinker. Other MPS that the Tories are targeting due to the large Brexit vote in their constituencies have been more supportive of anti-fracking - in Mansfield the Green Party have not stood this time against anti-fracking Labour MP Sir Alan Meale, who faces a strong challenge from a Tory Candidate who has worked for a strongly pro-Fracking Tory MP in the County. I spoke on behalf of Frack Free Notts and Frack Free Mansfield at the Nottinghamshire May Day Rally in Mansfield and got a good reception. Fracking is particularly stupid in this part of the country, honeycombed as it is with former mine workings - it definitely does not need another source of seismic activity. The Edwinstowe and Ollerton area is already known as “Earthquake capital of the UK” due largely to mining subsidence. In addition there is the Sherwood Sandstone aquifer which the frackers will need to drill hundreds of wells through if they are to have what they hope to be an economically viable gas field. It is the main drinking water aquifer for millions of people. A well connected relative of a Tory Minister urged that fracking take place in “the desolate North” and there is an unspoken assumption that the people of the former coalfield areas are desperate and will take any old crap that is thrown at them. But people of these areas are made of sterner stuff. They know the price of divided communities (and the bribe ridden, community rupturing process of Fracking is guaranteed to divide) from the bitter experience of the Miners Strike. Quite frankly the people of these communities are fed up of being seen as the most likely place to put incinerators, or landfills or frack sites. One of the relatively buoyant local industries is leisure and tourism around Sherwood Forest – this is obviously under threat – holiday in a gas field anyone? We are not a soft touch. Every delay, every difficulty, blockade and lock-on eats into the time this industry has to prove itself to its’ investors before they get cold feet. All allies from all parts of the country are welcome. This will be a major battle between the people and the environment on the one hand and the power of big business and the Tories on the other. Look out for escalating planned actions throughout the summer and lend your support physically or financially.